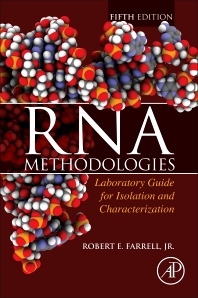 RNA Methodologies, Fifth Edition continues its tradition of excellence in providing the most up-to-date ribonucleic acid lab techniques for seasoned scientists and graduate students alike. This edition features new material on the exploding field of microRNA as well as the methods for the profiling of gene expression, both which have changed considerably in recent years. As a leader in the field, Dr. Farrell provides a wealth of knowledge on the topic of RNA while also giving readers helpful hints from his own personal experience in this subject area. Beginning with the most contemporary, RNA Methodologies, Fifth Edition, presents the essential techniques to use when working with RNA for the experienced practitioner while at the same time providing images and examples to aid the beginner in fully understanding this important branch of molecular biology. The next generation of scientists can look to this work as a guide for ensuring high productivity and highly representative data, as well as best practices in troubleshooting laboratory problems when they arise.